Wow! What a supportive community we live in. This year for the month of August we participated in the social media challenge Parma for a Farmer. Our goal was to raise $2000 to contribute to The Need for Feed Drought Relief fund managed by Pakenham Lions Club. We were lucky enough to earn the support of our friends at Iron Jack and also from Yarragon Football Netball Club who donated one week’s raffle takings into the cause. 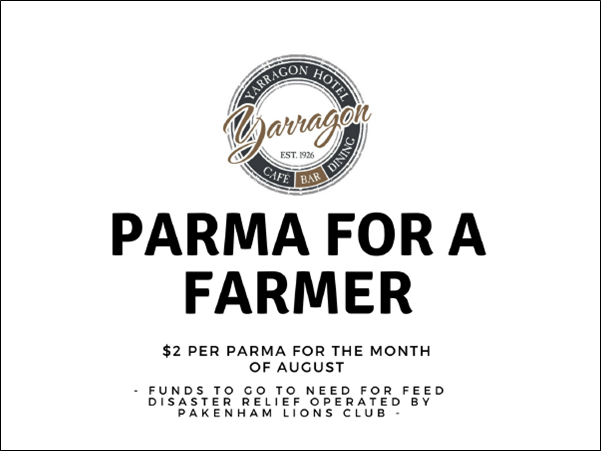 This support, along with the chicken parma purchases (kids, senior and full sized) and a Farmer’s bucket donation tin meant that, in one month, we raised a whopping $2135 for our Farmers in Need! A VERY big thank you to our community and supporters! Congratulations to all involved.